As a hommage to the 200th year since Liszt’s birth, I thought I’d hunt out some of his ‘easier’ pieces as I am sure many pianists don’t think that such a thing exists! The Hungarian composer, Franz Liszt became renowned throughout Europe during the nineteenth century for his great, virtuosic skill as a pianist. He was said by his contemporaries to have been the most technically-advanced pianist of his age and perhaps the greatest pianist of all time. I remember once reading that if any other pianist of Liszt’s time could play one of his compositions, then he’d sit down at that piano and rewrite it until it was so complicated that he was the only pianist who could ever perform it! His music compositions remain amongst some of the hardest repertoire for pianists and his pieces feature repeatedly on recital programmes by the most famous pianists. Usually, it is rare to find a Liszt piece that can be approached until you are well beyond all the piano grades and studying towards a Diploma, but I have found a few that could be tackled by Grade 6, 7 or 8 students. Listed in order of difficult, one piece for grade 6, 7 and 8. Most of his music is known for it’s razzle dazzle and feats of virtuosic pianistic ability, but there is a whole range of compositions, largely from his later years, that are technically less challenging. Most of the pieces I have picked are the slower, introspective pieces that still require the ability to convey the soul-searching message of his music but without the added challenge (and headache) of the dizzying technique that Liszt demands. Here’s something jolly to start off with, a Waltz that sounds like something you would hear in a music box. I first heard this piece used on the soundtrack for Eyes Wide Shut. It was probably the only thing that I liked about the film! Nuages Gris is one of Liszt’s most haunting and at the same time one of his most experimental works as it is quite atonal with it’s restless, unresolved dissonances throughout that make the piece slightly uncomfortable for the listener. Nuages gris is short and technically simple. The mood of the piece is bleak and morbid – definitely not one for an encore! And finally, I leave you with a performance of Liszt’s 2nd Hungarian Rhapsody performed by Lang Lang – watch him go crazy at the piano! 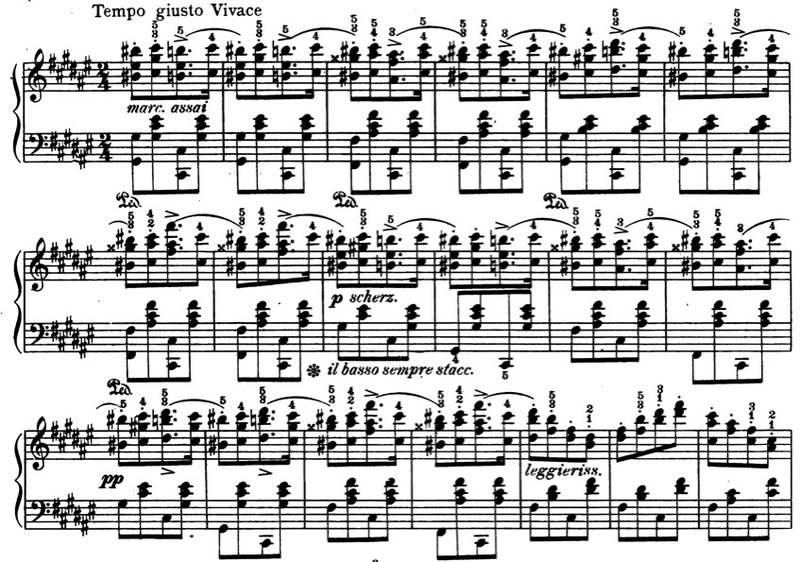 Below is an excerpt of the piano score when the crowd start applauding at a particularly jaunty bit of the piece. This entry was posted in Liszt, Piano lessons. Bookmark the permalink.